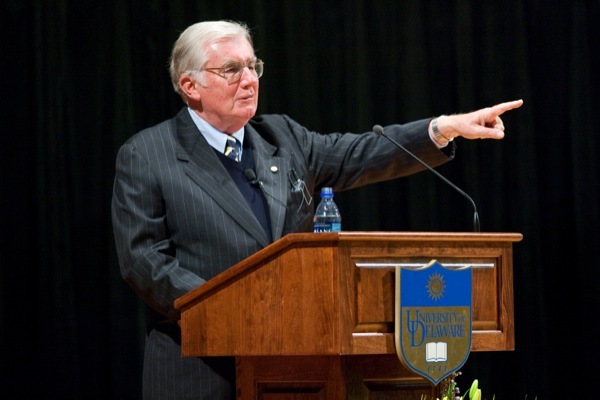 In 2008, Charles Cawley delivered the inaugural Presidential Lecture on Leadership at the University of Delaware. Before the lecture, he met with students for an informal question-and-answer session. 1:36 p.m., Nov. 20, 2015--Charles M. Cawley, generous benefactor and a former member of the University of Delaware Board of Trustees, passed away Nov. 18. He was 75. "Charlie Cawley was a devoted friend, a generous supporter and a steadfast champion of the University of Delaware, playing an instrumental role in strengthening the Lerner College of Business and Economics," said UD Acting President Nancy M. Targett. "As a UD trustee from 1994 to 2006, Charlie spearheaded a $20 million gift from the MBNA Foundation in memory of Alfred Lerner, Chairman and CEO of the bank, to endow the business college. Through his personal philanthropy, Charlie set a strong example for other donors and institutions. "Many UD alumni started their careers at MBNA and continue to work in the financial services industry, thanks to the close partnership between Charlie and UD. He understood the value of education both to students and to the larger community in which they would live and work," she said. "Charlie will be missed by his many friends and colleagues, but the University and the entire state will benefit from his visionary leadership for many years to come." A loyal donor to the University, Mr. Cawley made generous philanthropic gifts to Athletics, Academic Programs and, most notably, to the Center for the Arts named in honor of David and Louise Roselle. He was instrumental in the naming of the Alfred Lerner College of Business and Economics -- dedicated to honor the memory of his good friend and business partner Al Lerner. Mr. Cawley was integral to the growth and strength of the relationship between UD and MBNA. Thousands of UD graduates found their first jobs at an MBNA office or call center. Through the MBNA Foundation, over $100 million was awarded in scholarships to talented young people to attend college. UD honored Mr. Cawley with an honorary Doctor of Humanities degree at Commencement on May 31, 2008. Howard Cosgrove, then chairman of the board, read a citation honoring Mr. Cawley as a "visionary business leader" and "caring philanthropist" who made life better for thousands of his fellow citizens and who served as a mentor to countless young people. A resident of Vero Beach, Florida, Mr. Cawley also lived in Camden, Maine, and Wilmington, Delaware. Born Aug. 15, 1940, he was a graduate of St. Benedict’s Preparatory School of Newark, New Jersey, and Georgetown University. A music aficionado, he was a proud member of the Georgetown Chimes. He began his financial services career in 1963, later co-founding what would become MBNA America Bank in 1982. He and his partners pioneered affinity credit card services and built MBNA into one of the largest credit card financial institutions in the world. He retired as CEO of MBNA Corporation at the end of 2003. During his long career, Mr. Cawley served as a member of the Board of Directors of Georgetown University, receiving the John Carroll Award for service to the school. He was also a board member of St. Benedict's Prep, where he had earlier attended high school. He founded the Starfire Fund at that school, which provided many scholarships to inner-city boys and girls attending high school and college. In addition, he served on the boards of the George Bush Presidential Library, the American Quality Foundation and the Grand Opera House in Wilmington, Delaware. He was an honorary member of the American Institute of Architecture. Mr. Cawley was an avid collector of vintage automobiles and American artwork  he served as a board member of the Owl’s Head Transportation Museum, the Farnsworth Art Museum, and the Wyeth Foundation. He and his wife, Julie, also were passionate advocates for the young and the disadvantaged through their support of many educational scholarship programs and the Ministry of Caring in Wilmington, Delaware. They also supported Indian River Medical Center, Vero Beach, Florida, and PenBay Medical Center in Rockport, Maine. He was a member of Holy Cross Church in Vero Beach and Our Lady of Good Hope in Camden, Maine. Mr. Cawley is survived by his wife of 52 years, Julie P. (Murphy) Cawley of Vero Beach and Camden; his two children and their spouses, C. Michael Cawley III, his wife Carol and children Charlie and Emma of Atlanta, Georgia, Maureen C. Rhodes, her husband Michael and children Julia and Thomas of Wilmington, Delaware; his sister, Constance Devanney of Swampscott, Massachusetts, and close friends Michael and Toni Nash and their children Hannah, Elle and Sam of Wilmington, Delaware. A Mass of Christian Burial will be held at 11 a.m., Saturday, Nov. 21, in Camden, Maine. A memorial service is planned for friends and family in Wilmington, Delaware, in January with the date to be announced. In lieu of flowers, charitable donations may be made to the Sussman Hospice House, C/O PenBay Healthcare Foundation, 22 White Street, Rockland, ME 04841; Office of Advancement, St. Benedict’s Preparatory School, 520 Dr. Martin Luther King, Jr. Boulevard, Newark, NJ 07102; or The Ministry of Caring, 506 North Church Street, Wilmington, DE 19801-4812. To share a memory or condolence with Mr. Cawley’s family, please visit his Book of Memories at the website of Burpee, Carpenter & Hutchins Funeral Home.